This article was published in the Queanbeyan Age on 16 May 2003. 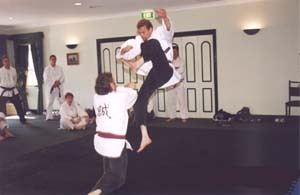 Since the official handing over of the leadership of the Peter Morton Academy of Judo Jujitsu Karate in October 2002, the founder and former Principal, Peter 'Frog' Morton, has had nothing but praise for his "boys". Frog is very impressed with the leadership and loyalty that David Rowley, the new Principal, and Edward Scharrer, the new Deputy Principal, have displayed. "I wouldn't hand it over until the time was right," Frog said. These words echoed around the academy whenever the question arose as to who should take on the enormous role of leadership and fill Frog's boots. Frog is so pleased with how the academy is flourishing under Rowley and Scharrer's leadership that he wants to tell the whole world about their efforts, and rightly so. Just after they tossed their nappies aside, Rowley and Scharrer started training with the academy. Since then they have trained their way up through the ranks with a lot of sweat, tears and sometimes blood. Their dedication and loyalty to the teachings and ways of Frog has been returned to them by the membership of the academy. Frog's one wish is that the academy membership shows the same loyalty and respect to Rowley and Scharrer that it has shown to him over the past forty years. It has not been all that easy during the past seven months for the new leadership. Outside influences have forced changes upon the academy, not in its teachings but rather in its structural organisation. This was a good test for the boys and they have brought the academy through to a higher level without compromising Frog's vision or the academy's principles. With a lot of help from a dedicated team, led by Rowley and Scharrer, long term plans are under way to ensure that the academy way of life will continue well past the twenty-first century and that a lifetime of work by Frog is honoured and preserved.